(Avengers Annual#2 (fb)) - As the Hulk considered quitting the Avengers following their battle with the Space Phantom, the Scarlet Centurion appeared to them, convincing them that he would cure the world of famine, plague, pestilence, and all other evils that faced mankind, if they would right a cosmic imbalance caused by the presence of too many super-powered beings. Desiring to resolve the problems the Centurion had offered to resolve, the Avengers then captured and imprisoned every superhuman or costumed adventurer on Earth. They then issued an edict to the governments of the world that no further atomic tests would be performed, so that no further superhumans would be created. The Scarlet Centurion then told them that five more beings would soon appear, and that once they, too, were defeated, the balance would be corrected, and he could fulfill on his promise. (Avengers Annual#2) - While traveling through time, the Avengers of Earth-616 (Black Panther, Captain America, Goliath, Hawkeye, Wasp) were sent to this reality. They eventually stumbled across their counterparts in Avengers Mansion and then fled to regroup and figure out what was going on. The Avengers of Earth-689 contacted the Scarlet Centurion and revealed that they had encountered the five he had prophesied, and he instructed them to subdue the five as soon as possible. The Avengers of Earth-616 used a Herodotron to learn Earth-689's recent history, after which they realized they must defeat this world's Avengers and foil the plot of the Scarlet Centurion. Dividing their targets up, Hawkeye defeated the Earth-689 Iron Man by using an acid arrow to drop a girder on his head. Hawkeye then used a sonic arrow against the Earth-689 Hulk, and the intense noise somehow transformed him back into Bruce Banner, whom the Black Panther easily subdued. Captain America managed to keep the Earth-689 Thor away from his hammer for 60 seconds, and then he knocked Don Blake out. Goliath held the Earth-689 Giant-Man underwater during their struggle, and Goliath's advanced training to prepare for future conflicts with Namor allowed him to outlast his counterpart. The Earth-689 Wasp was distracted by her lover's defeat, and her Earth-616 counterpart zapped her unconscious. The Earth-616 Avengers then traveled to Dr. Doom's castle and reassembled his time machine, after which they were confronted by the Scarlet Centurion. The time traveling villain began to pick the Avengers off one by one, but Goliath, shrunken to ant-size, managed to rewire the time machine so that it banished the Centurion as an immaterial wraith trapped between the years. (Avengers Forever#11-12) - The Avengers of Earth-689 were amongst those summoned to assist the Time-Keepers against the Avengers Forever group during the Destiny War. Comments: Created by Roy Thomas, Don Heck, Werner Roth, and Vince Colletta. It was named Earth-689 in the Official Handbook of the Marvel Universe: Alternate Universes 2005 instead. This reality diverged from Earth-616 in the final moments of Avengers I#2. As the story in What If? I#29 was specifically stated to be a reality diverging from the events of Avengers Annual#2, one can assume that any being seen in that reality was also present in this one. Those seen in that issue, but not Avengers Annual#2, include Baron Mordo, the Black Panther, Blob, Cobra, Grey Gargoyle, Hawkeye, Professor X, Ringmaster, Vanisher, Yellow Claw, and a few others I can't identify (Popeye is probably one of them). Also not identified would be Rick Jones and Loki, and anyone else from Avengers I#1, plus anyone else from Earth-616 prior to the conclusion of Avengers I#2. 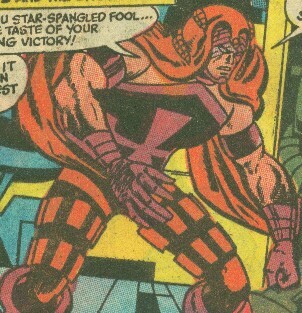 The Scarlet Centurion seen in this issue is the man who was Rama-Tut, just before he became Kang the Conqueror. He has a profile in the Official Handbook of the Marvel Universe Update '89. 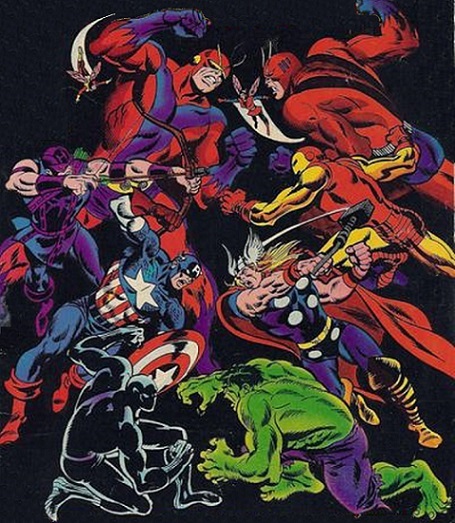 Avengers Annual#2 asks the readers why Captain Marvel was not amongst the heroes seen being captured by the Avengers. The reason is that Mar-Vell was sent to Earth to investigate the destruction of Sentry#459 by the Fantastic Four. No FF => No Sentry destroyed => No Captain Marvel on Earth. Presumably, for similar reasons, Captain America was not active on this world. Namor was captured, and so he never had the opportunity to come across the frozen form of Captain America in the Arctic, and so it remained there, inert. The Avengers Index (1987) discusses that Captain America died during World War II in this reality. This is based on Thor's comment that Captain America had departed the mortal coil years before. I have to disagree with that conclusion. If you'd have asked any of the Avengers prior to Avengers I#4 what had happened to Captain America, they'd have said he had died during World War II, because that was what was thought prior to his being found thawing in the Arctic waters. It's an alternate reality, so he could have died, but that would have meant that the reality did not diverge from Avengers I#2, as has always been claimed, but rather that it would have diverged in 1945, decades before. It's a moot point, because he wasn't seen anyway. Uatu the Watcher erased the memories of the Earth-616 Avengers adventures on Earth-689, though I'd suspect that like most cases of such things, their memories were just submerged. 1968 was way before the age of miniaturization, and so really powerful computers were gigantic in the sci-fi of those days, sometimes even spanning whole cities. What If I#29 claims that it was Immortus who sent the Avengers of Earth-616 to Earth-689 in order to defeat his renegade counterpart, but in Avengers Annual#2, the Scarlet Centurion discusses influencing their arrival there. Perhaps Immortus was able to manipulate the Scarlet Centurion to engineer his defeat. At any rate, it was likely Immortus who sent the Avengers back to Earth-616. Captain America Annual#11 confirms that the Scarlet Centurion brought them there, but that still doesn't mean he wasn't being manipulated by Immortus. Following the events of Fantastic Four I#19, Rama-Tut traveled forward in time, encountering a temporal storm and ending up in the modern era of Earth-616. After a meeting with Dr. Doom, Rama-Tut decided to design his own body armor, took the name Scarlet Centurion, and traveled to Earth-689 to conquer it. He engineered the arrival of the Earth-616 Avengers on Earth-689, intending for the more experienced Avengers of Earth-616 to defeat their counterparts, while he could then more easily overpower the Earth-616 group, which lacked the power of the Hulk, Iron Man, and Thor. However, the Earth-616 Avengers banished him from Earth-689, trapping him within the timestream. Eventually escaping back to the 40th Century, he took the new name of Kang the Conqueror. The Scarlet Centurion possesses advanced technology, enabling him to travel through time, cross dimensional barriers, fire energy blasts, and affect the thoughts of others. Note: The Scarlet Centurion is also the past self of Immortus. see the full list of those associated with the Scarlet Centurion in the Catalogue of Correspondences for Chthon. 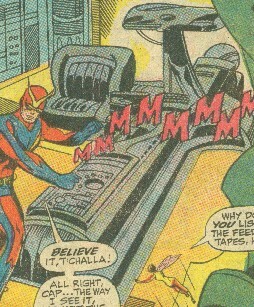 A giant computer, completed one year before the events of Avengers Annual#2, Hank Pym assisted in its development. It recorded all historical data then used narrative feedback to instill the knowledge directly into the minds of others. Vast amounts of knowledge could be passed on to its user in the space of seconds, though the process could be quite overwhelming. Versions existed on both Earth-616 and Earth-689 (though only the latter has been seen), and it enabled the Avengers of Earth-616 to learn the recent past of Earth-689.